I don't know how it's possible but I kind of just discovered Tanya Taylor. A few weeks back I was perusing the aisles of Saks Fifth Avenue and was immediately drawn to the beautiful colour and patterns of her designs. If you know me, you know I am a huge lover of all things pattern (I mean, did you see my last post?). Don't get me wrong, I love wearing the basics but sometimes a girl needs some colour in her life! This dress is one of those dresses that made me feel super pretty and feminine and I LOVE IT! 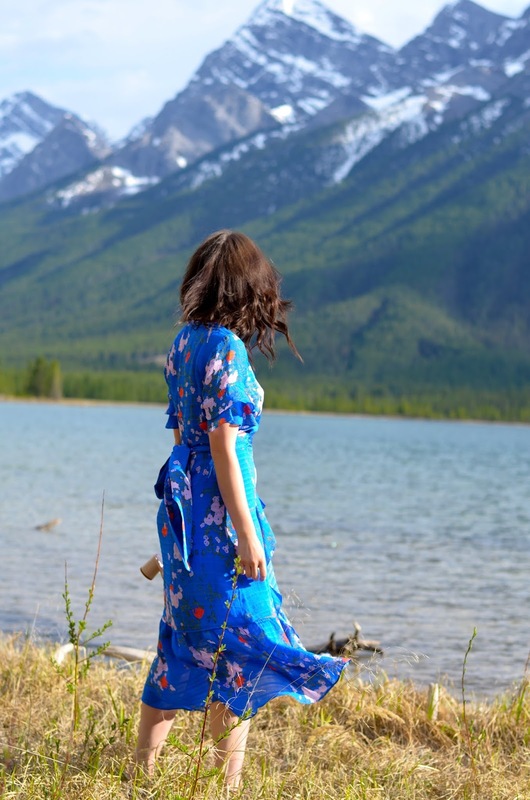 I thought it would be so pretty to take photos just outside the national park and really showcase how gorgeous this dress is. I feel so fortunate to live literally an hour away from the beautiful scenery. Also, upon some research I saw that Tanya Taylor is a fellow Canadian and initially studied finance then switched careers into fashion. She's also SO young! She's honestly an inspiration, she's only 32! Her designs have been worn by Former First Lady Michelle Obama (ummm goals), Kristin Wiig, Olivia Munn and Sandra Bullock just to name a few. Thanks to Saks for letting me borrow this gorgeous dress!